This certainly surprised me in a few ways. At the same time it was interesting just to see the focus brought to the friendship of Sakuta, Futaba, and Kunimi. This arc is very much about Futaba, but at the same time it was about the three of them. The solution for Futaba in part was simply the girl understanding that she isn’t as alone as she imagined herself as. Neither Futaba tried reaching out to Sakuta or Kunimi when their split happened. You had one Futaba living at her home and the other hiding out. They weren’t even talking to each other much less reaching out to their friends. You can see how Futaba was an isolated person to start with and once she gained friends she started to fear being alone. And yet the problems piled up because she wasn’t willing to place trust in those friends. There are so many little payoffs with this show. The obvious one is how the next girl up has a little scene or hint about who they are and what their issue is going to be. We saw it in this episode with the idol girl who clearly is rather obsessed with Mai. And we also saw it in last episode how Kunimi said he’d be there if Futaba was in need. 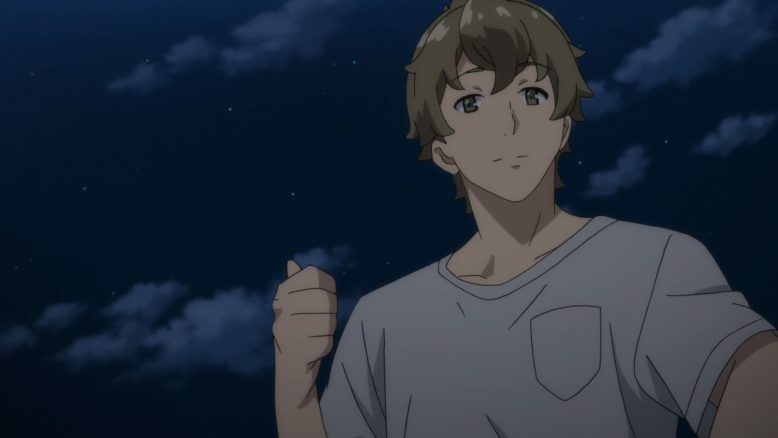 So Sakuta just called up him and he biked there as he said he would. And really it wasn’t as if this was a prank either. Futaba really was in emotional need and required a reminder of how solid her friends are. It doesn’t matter if Kunimi or Sakuta have relationships. Yes it matters a bit more when it comes to Kunimi since Futaba is in love with him, but that doesn’t negate their friendship. And I’m ok with that. These guys have their lives and their romantic attachments. But those are one thing and their friendships are another. If Futaba needs her friends to be there as her friends, then they will be there. If it means running around in the middle of the night and goofing off…then that’s exactly what they’ll do. 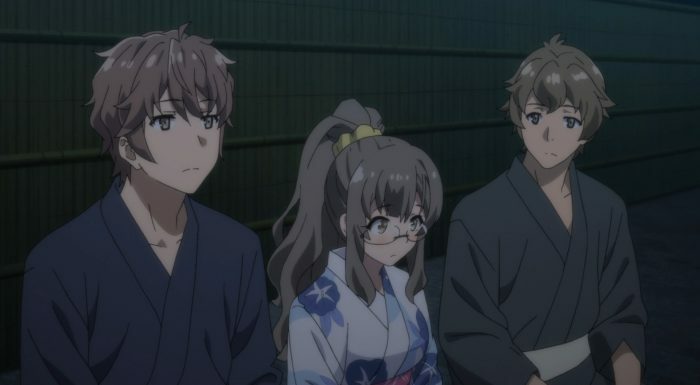 Also it’s funny to think that all these arcs have made their way to the beach at some point; Mai met her mother at the beach, Koga had a date with Sakuta there, and now the trio fooled around with fireworks. For whatever reason I can’t comprehend, Kunimi cares about his girlfriend. But no matter how much she complains or harasses his friends, he’s not going to stop being friends with them. Futaba in general needed to see that. If she’s worried or needs attention…she’s got friends. She isn’t alone. It was an interesting surprise to have the things Futaba 2 was doing being something Futaba had been doing before the split. That in itself was part of the reason for the split. Futaba both wanted attention and despised herself for it. It makes sense that one kept on doing it after the split and the other just was frustrated. 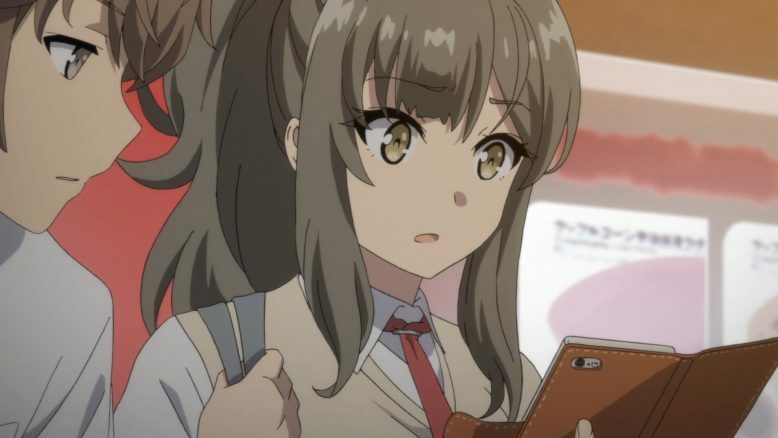 And honestly it made sense to have Futaba freaking out when she got messages that were pretty risky. Just because Futaba 2 was going around and still doing this…didn’t mean she wasn’t Futaba anymore. She split into two, but both remain the same person. Of course she’d go into a panic. And really they are just lucky things both turned out alright and that it sparked Futaba to just destroy that account. That it just ended with someone threatening and attempting to blackmail her is enough. A frustrating bit of a situation though for Mai and Sakuta. 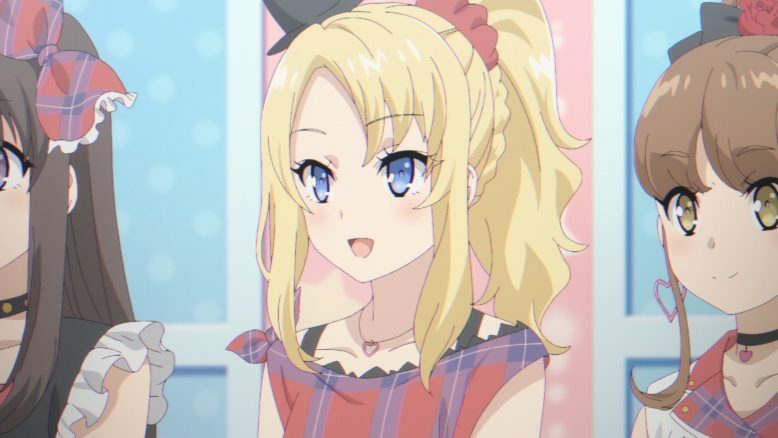 Mai is right that she isn’t some idol here. Different cultures of course have different views on things. But Mai is focusing more on being an actress and straight up left the industry when her mother tried to push her into a direction she didn’t want to go. Rationally she knows that people and fans will obsess over her to varying degrees. 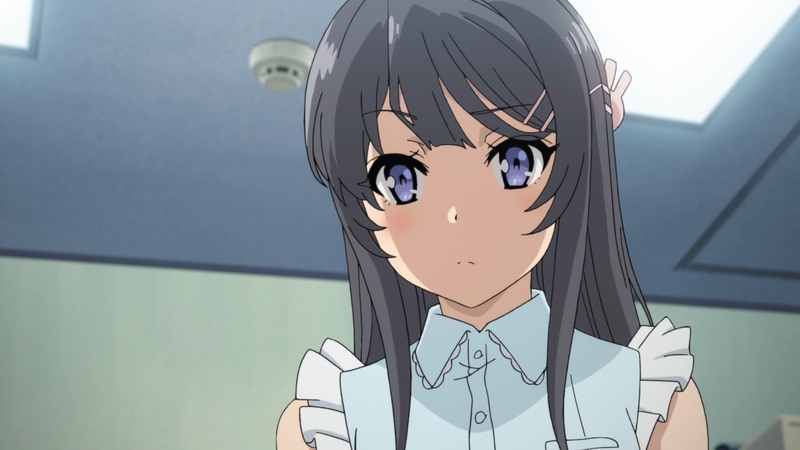 However I don’t see Mai being the type to accept that being a professional actress means she can’t have relationships. For the time being though I get that it is just safer to play it conservatively. Mai can’t exactly keep dumping agencies in rapid succession. Better to be cooperative for the time being and continue building up her career. Then she can worry about getting across to her agency her viewpoints on this issue. Despite this being a 2 episode arc I didn’t think the pacing was badly hurt. They did have to move around, but I’m not sure expanding this to a third episode would have made it dramatically better. I think we got a good picture as to what was going on with Futaba. Things concluded pretty simply, but I’m ok with that. I tend to agree with Sakuta that it’s fine for Futaba to have issues with herself. That’s just how people tend to be. And I think it was the best of both worlds to have Futaba sort of find a middle ground with herself. She ended up going to the fireworks with her friends, with her hair up, but wearing her glasses. And hey she did manage to get herself to confess. Perfectly fine to have that be a moment we don’t have to hear. So now we’re set for the next arc. Obviously a main party to this will be the idol girl we saw in this episode. We can certainly speculate the focus of the arc and the connection to Mai. 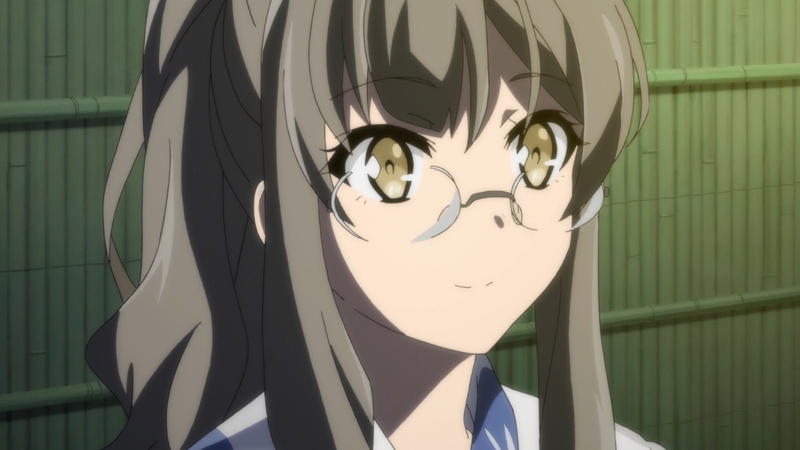 There’s no way they’d show this girl being obsessed with Mai without Mai mattering. Now we can speculate a bit on where this is going. But I think the best thing is just to see how the next episode plays out and reacting to those events as they happen.